I’d like to provide my summary of the discussion in that part that concerns our exchange with Nick Stokes and how it relates to paper content and the broader picture of our work. It was repeated by Nick here, here, here and elsewhere. This argument presumes that our system of equations (32)-(34) is mathematically inconsistent (contains a “mathematical fallacy”). This argument is false. The system is mathematically consistent. Those willing to consult an independent opinion please see the comment of Tomas Milanovic. When challenged to derive the contradiction “1=0” explicitly from (32)-(34) Nick made two elementary algebraic errors (see here and here). At one place he seemingly implicitly conceded that there is no mathematical contradiction (but still made a later effort to derive one). My take on the “mathematical fallacy” issue is here, here and here. The argument “1=0” profoundly misinforms the reader about the actual issues that are worthy of discussion. II. The derivation of Eq. (34). It should be made clear that Eq. (34) in the paper was not derived from any other known equation. It was formulated based on several key physical propositions. These propositions are summarized here. They deserve a thoughtful physical consideration by anyone willing to understand the underlying physics. The formula is the same in all cases. Therefore it does not depend on gravity. When asked if any formula that contains something depending on gravity must explicitly contain g, Nick changed topic. To this I responded that “to see no relevance” and “find an error” is not the same. 2. Additionally, Nick produced an alternative derivation of S (the one also presented by Dr. Held in his review with a reference to Nick). This derivation was independently reproduced by Cees de Valk. See here for a relevant thread. Note that Eq. (34) is S = wN∂γ/∂z, where γ = pv/p is the relative pressure of water vapor and N is total air molar density. The alternative derivation of Nick et al. produces what we can call SNick = wNd∂γd/∂z, where Ndis dry air molar density and γd = pv/pd is the ratio of water vapor to dry air pressure. Since pv << p, pd and p are very close, so S (34) and SNick (Sd in our paper) differ by a small magnitude. This result is mathematically valid (no contradiction in the equations), but it implies that generally, under any possible circumstances on an isothermal surface, winds cannot have a velocity component parallel to the pressure gradient ∂p/∂x = RT∂N/∂x. So this result is invalidated by observational evidence (e.g. radial convergence in hurricanes). By inference, whatever were the physical grounds from which SNick was derived, they were incorrect. It is a classical case where a small detail matters (“devil in details” etc.) To understand why it matters requires a deeper insight into the underlying physics, not merely manipulating with the continuity equations. 3. There is an alternative physical derivation of S (34) as presented in the blog and here based on energy consideration. This complementary view, although explicitly present in the paper, might not have been sufficiently clearly articulated. This alternative derivation does not involve any small factors in deriving (2C) above. These considerations provide independent support for the physical arguments used in deriving (34). None of the commentators here, Nick included, has ever commented on that. In the meantime, we now think that this second view on how (2C) (the main result) is obtained is more easy to understand from the physical viewpoint. We recommend people who just have their first look on the subject to evaluate it first. 4. The argument about S = CNv (see here, here, and here) is confusing. Otherwise this argument is a distraction. When challenged during the ACPD discussion to better explain the physical foundations of Eq. (34), we showed that Eq. (34) can be interpreted as S = wkvNv, where kv is the degree to which water vapor partial pressure deviates from hydrostatic equilibrium. This proportionality is physically consistent with S being a first-order reaction in Nv, but certainly S = wkvNv cannot be formally derived from chemical kinetics. From the empirical viewpoint, since C is not a constant (it does not depend on Nv, i.e. it is a constant with respect to Nv only), the formula does not presume rain from dry air. Since to appreciate this linearity argument requires an understanding of what kv is, this argument is of little help for those who want to get a first idea of the physics behind (34). Again, I recommend this account. against empirical evidence, as I outlined here. Nick made a few attempts, but they have so far been inconclusive. I emphasize (2C) is an extraordinarily strong statement (see Eq. (4) in the post which is the same). It predicts that where condensation is absent, winds cannot blow along the pressure gradient or that the pressure gradient must be absent. It also predicts the reverse (lack of condensation where u∇p = 0), but the latter prediction is less informative as it does not specify the scale at which this lack of condensation should be manifested (it can be very narrow). The meaning of the differential form of 2C (see Eq. 4 in the post) is that all potential energy released from condensation is locally converted into the power of the large-scale horizontal pressure gradient force u∇p. This is very strong. At what scale it is actually true remains to be seen. It will also help to discriminate between condensation-induced dynamics and other mechanisms at work in the atmosphere (e.g. 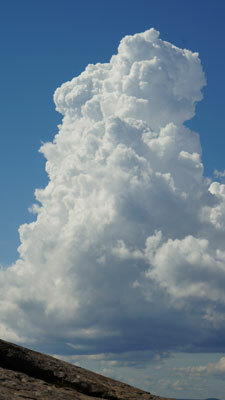 forced convection can be different). As a bottom line, the integral form of (2C) has already produced meaningful results, so it can serve as an integral limitation on the dynamic power of circulation. For us the main point is that our theory (unlike the existing models) yields empirically falsifiable predictions. It is a working theoretical concept for a moist atmosphere. 2. The last but one section in our blog is very important for future theoretical analyses. 3. How the theory can be empirically tested is outlined here and here in response to manacker (Max). It is said quite enough for anyone who got a basic physical idea to publish original papers based on observational analysis. There seem to be lots of relevant data around. 1. My personal view on why the paper was accepted. 2. I would like to express our gratitude to Nick Stokes for his persistent attention to our work. My personal view: For people who like us have a clear picture of underlying physics Nick’s comments can provide additional details and angles. For those people who do not have a clear physical picture and make their first acquaintance with the idea, Nick’s comments are paralyzing and preventing any further understanding. Cannot be recommended for students. Thank you very much for this exciting discussion. The biotic pump mechanism transports atmospheric moisture from the ocean to the forest-covered continent. This large-scale process is based on cumulative performance of many similar small-scale functional units in the forest. We termed these units “local ecological communities”. A local ecological community in the forest ecosystem is a tree with all the spatially associated local biota (including soil) — including bacteria, fungi, small invertebrates etc. Please see Section 4.3 of Gorshkov et al. (2004) for a discussion. To evaluate the biotic pump performance of a single tree or a small forested area it is necessary to measure how the local influx of atmospheric moisture has changed upon the tree re-growth. Whether it is measurable depends on the sensitivity of natural selection. If it is higher than the accuracy of our measurements, it will not be possible to detect a small-scale biotic pump. The signal from a small area will be lost in the high fluctuations of the local moisture transport and rainfall processes. The biotic pump enabled life to colonize land. The first plants capable of running the pump originated at the coastline. This narrow band of plants was obviously unable to draw moisture far inland. However, these plants might have been able to slightly increase local rainfall making the prevailing winds to slightly change their path. For example, the plants could enhance intensity of local condensation and modify local pressure gradients by emitting biogenic condensation nuclei. Gradually spreading inland the plants were bringing moisture with them — by enhancing the atmospheric water vapor flow. Thus, a group of trees planted in the desert may not have any biotic pump potential at all, as it has no link to the oceanic source of moisture. On the other hand, the biotic pump is based on a large number of evolutionary properties of various species. Among them is the ability of the ecological community to efficiently store moisture in soil, to regulate the vertical temperature gradient under the canopy, to modify aerodynamic roughness of the area etc. These properties profoundly influence the local microclimate and are readily observable on a small scale. Who is the Champion of Champions: Sergey Kirdyapkin, Ivan Ukhov, Usain Bolt or Michael Phelps? What would have happened to a flea had it jumped to a height of 2 meters? In which sports is man second only to the donkey and the elephant? All animals can move. But each species has perfected in a particular type of motion. Some animals set records in running, others are particularly good at walking or crawling, yet others are outstanding arboreal acrobats. Swifts fly better than anybody else, but they are pathetic on land where they can only crawl very slowly searching for a small hill from which they could take off. Loons fly very well both in the air and underwater, but they cannot walk. It is a huge problem for a loon to approach her nest moving on the ground – because of that the loon must build the nest very close to the water edge of a lake or a river (they cannot nest on the seashore because sea water comes and goes with tides). Moles can dig tunnels under the ground at a rate of up to 10 cm per second, but they practically never show up above the ground. Brachiating monkeys that rely on their hands to move in the tree canopy make great acrobatic performances on the trees but avoid coming down to the ground. Pederson et al. 2012 investigated the recurrence of droughts in some parts of the U.S. starting from the end of the 17th century. The study was motivated by the recent increase in drought frequency — the researchers attempted to look at it from a historical perspective. It was concluded that the period from approx. 1700 to 1820 saw particularly many drought events, while the 20th century as a whole was more comfortable. Fig. 3 of Fitzjarrald et al. 2001 Journal of Climate 14: 598. Dynamics of forest cover in some states. One can see that starting from 1700 and until approximately the middle of the 19th century forest cover in the U.S. was being eradicated most rapidly. Then forests started to regrow and had been increasing in size for more than a century. Data for the last twenty years are missing, but one can notice a declining trend in forest cover to be there again starting from the 1990s. And during the last twenty years the droughts came back. This is consistent with the biotic pump concept. Degradation of forest cover in Eurasia and North America make the two continents drier. As the remaining forests compete for moisture of the Atlantic, the growing drought zone migrates from one continent to another. For example, when in 2010 there was a disastrous drought in Russia, in the U.S., on the contrary, the percentage of land experiencing drought was exceptionally low. It would be interestig to analyze similar data for Russian droughts and Russian forests. Makarieva A.M., Gorshkov V.G., Li B.-L. Revisiting forest impact on atmospheric water vapor transport and precipitation. Theoretical and Applied Climatology, doi: 10.1007/s00704-012-0643-9. Water cycle on land owes itself to the atmospheric moisture transport from the ocean. Properties of the aerial rivers that ensure the “run-in” of water vapor inland to compensate for the gravitational “run-off” of liquid water from land to the ocean are of direct relevance for the regional water availability. The biotic pump concept clarifies why the moist aerial rivers flow readily from ocean to land when the latter gives home to a large forest — and why they are reluctant to do so when the forest is absent. Compared to our previous studies, in the new paper we used a global (rather than land only) precipitation database that allows one to compare precipitation patterns on land to those over the adjacent ocean. We extended our previous approach to analyze seasonal (rather than annual only) changes in the spatial precipitation patterns in world’s major forest regions. Apart from the tropical rainforests, we analyzed precipitation distribution across world’s longest (>7,000 km) forest belt, the Eurasian boreal forest. The data describe how the active summer forest wins the water “tug-of-war” with the Atlantic Ocean. Indeed, in summer the forest steals most moisture inland and depletes the oceanic precipitation. The dormant winter forest loses this war to the ocean, such that precipitation over the Atlantic Ocean in winter, despite the oceanic evaporation is minimal, rises threefold compared to summer months. Analyzed for comparison, the unforested Australia is unable to draw moisture far inland in either wet or dry season, i.e., irrespective of moisture availability over the neighboring ocean. While it is increasingly common to blame global change for any regional water cycle disruption, the biotic pump evidence suggests that the burden of responsibility rather rests with the regional land use practices. On large areas on both sides of the Atlantic Ocean, temperate and boreal forests are intensely harvested for timber and biofuel. These forests are artificially maintained in the early successional stages and are never allowed to recover to the natural climax state. The water regulation potential of such forests is low, while their susceptibility to fires and pests is high. The exploited forests are degrading; the relatively undisturbed old-growth forests are shrinking in size. A conflict (rarely appreciated or discussed) exists between the modern commercial value of a forest and the forest’s ability to regulate the regional water cycle and to be self-sustainable: these parameters cannot be maximized simultaneously. Therefore, the regional water safety is not about keeping the live forest biomass stationary. It is about keeping it stationary in an environmentally competent condition. You are welcome to visit http://www.bioticregulation.ru/ab.php?id=taac to download the paper, the Electronic Appendix, as well as to have a look at some animated graphs.